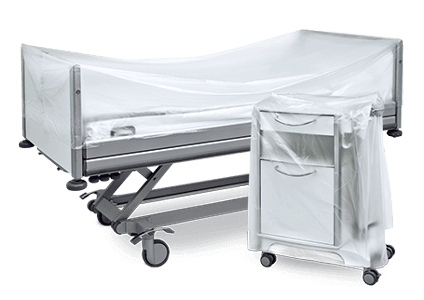 The Deiss range of protective covers for hospital beds and bedside cabinets guarantees professional and hygienic storage of furniture after its preparation for re-use. The exceptionally high quality foil used for the UNIVERSAL brand ensures maximum tear and puncture resistance despite minimal foil thickness. The covers contain an antistatic agent to protect against electrical charging. This enables easy opening of the cover and prevents the occurence of electrical discharges.